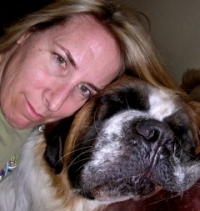 · Develop a mindful breathing practice, while massaging the dog. Massage creates bonding, stress reduction, and increases trust between guardian and companion. · Where the physical touch and massage are delivered are also important. Sasha and Mylo sit on the floor while Sasha massages Mylo beginning in specific parts of his body. This, combined with the mindful breathing, will elicit deep relaxation breaths from Mylo and the release of oxytocin in both parties. · Mindfulness based techniques for Sasha.